What Is A Lazy Lizard? I see Lazy Lizards everyday. In schools, daycares, yoga studios, outside, inside. They are everywhere. The look so relaxed and peaceful. Lazy Lizard Pose is the last pose of a kids yoga class, just like savasana or rest pose in an adult yoga class. After learning how to breathe, practicing fun yoga poses and playing a fun game, it’s time for kids to lay down on their yoga mats and unwind. Parents often ask me, “How do you get them to do that?” Some days it is easier then others, but most of the time the kids love it and are ready for it, after all their hard work. Kids these days hardly have any down time. They have to hurry up to eat breakfast, get dressed, get to school on time, do their home work, get to after school activities, eat dinner, and then it’s time for bed. Kids don’t think they can lie down and rest, unless it’s time to go to sleep. That is what Lazy Lizards Pose is, a time for kids to lie on their mats, close their eyes, relax and unwind, while paying attention to their breath, and just being. Some days in class I play soft music for them to listen to, often times I guide them through a story to help them relax and use their imaginations. 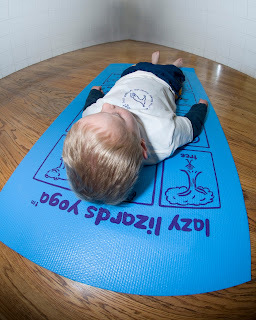 Have your child try Lazy Lizard Pose, encourage them to lie down on their yoga mat, softly close their eyes, and pretend that they are a Lazy Lizard laying in the warm desert. As they start to relax more their bodies start to form into the sand, feeling safe and secure, encourage them to feel the sun in their heart. When it is time for your child to come out of Lazy Lizards Pose, have them start to gently wiggle their fingers and toes, and come up to a comfortable seat, and take a moment to notice the giant smile upon their face as they come up slow and refreshed.